What we’re looking at right now is a standard showcase page. When you buy your BREW, you do get a certain number of these showcase pages that we build into your website by default. A standard showcase page does include homes for sale in that particular area within that specific price range along with a table up at the top that is automatically created as we build out these pages. 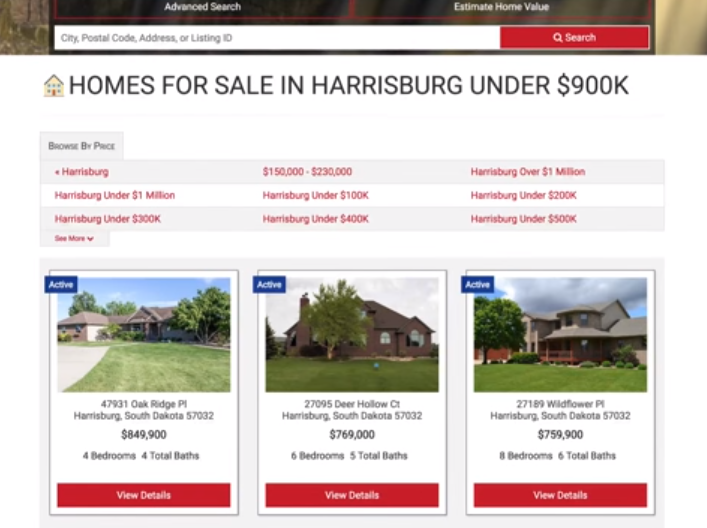 I have an example of a client’s website that does have a quite a few showcase pages built for homes for sale in Harrisburg. Each of these price ranges is going to be its own showcase page showcasing homes for sale in that area within that price range. If I click on Harrisburg under 600,000 versus the 900,000, you’ll see homes for sale within that price range appear here. So, that is a standard showcase page. It’s fairly simple. 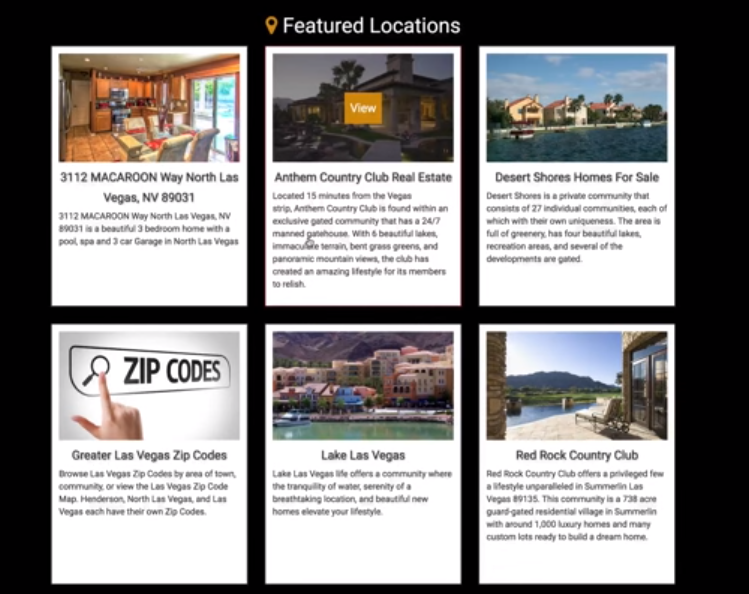 Now, as far as a featured showcase page, what that is going to entail is very similar to your standard showcase page where it shows the table up at the top of a showcase page and displaying homes for sale in that area. Typically the featured showcase page is your main area, not broken down by price, so this is another client’s website. 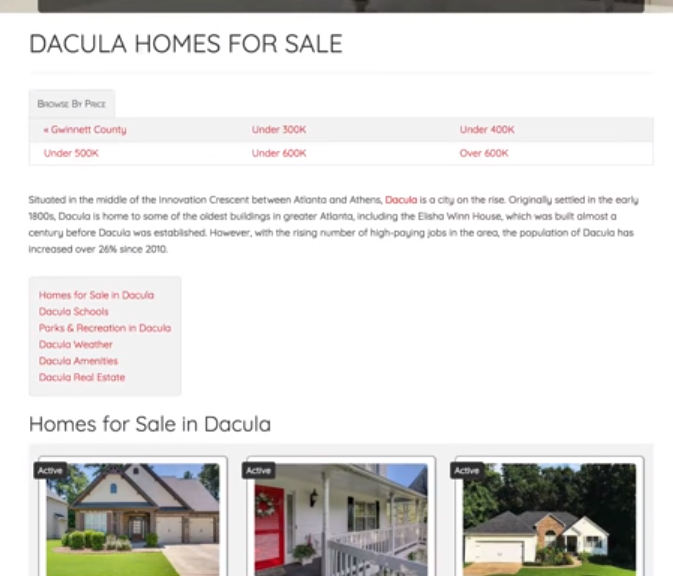 This is Dacula homes for sale, and we have homes for sale in Dacula here, and then we have standard showcase pages here that they can click on that will show them homes for sale within those price ranges. So the featured showcase pages are typically the page that you get to before you visit these smaller standard showcase pages. Also, on the feature showcase page, you do have some content that our team writes for you, so you have an introductory paragraph kind of about the area. You do have a nice table of contents where people can click on whatever they’re interested in reading more about and it takes them to that area. So if they’re interested in schools, they can click on that and it does drive them right down to that school’s section. 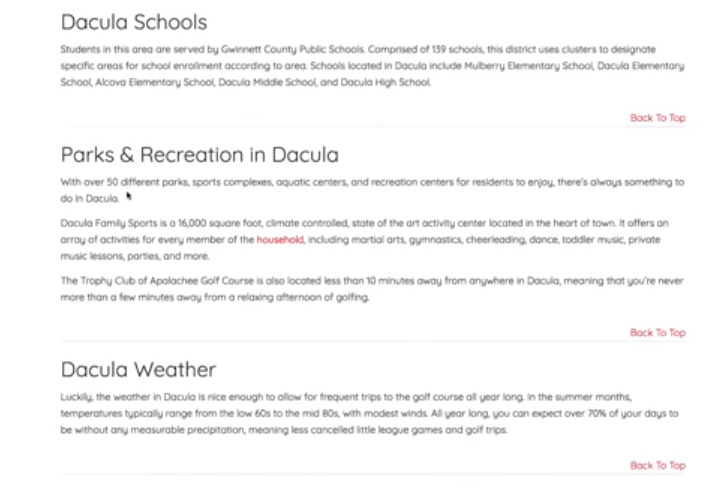 So, we have information about some schools, parks and recreation, the weather amenities, this is based on keyword research that our team looks at for your area to see what keywords people are searching for the most. The most popular ones, they kind of tend to repeat, which is weather, schools, real estate, parks, and recreation. So we do notice that those repeat in most areas. So, those are going to be the most common ones that you will see on your featured showcase pages. Now, the featured homes. I’m going to go over to our website here. The Featured Showcase pages will show up on your homepage, on your website. So if we scroll down, we have tons on our website, and this is going to also vary depending on which package you purchase for how many featured locations you get. But we have our featured locations here with a nice image. So if somebody lands on your home page, they can go to these featured locations and click on it and go to that particular featured showcase page. So, that is the difference between standard showcase pages and featured showcase pages. Just a quick recap. The featured showcase pages do contain extra content, a table of contents, and are typically a larger area like a county, a city or neighborhood. It doesn’t go into the prices. These standard showcase pages go deeper into the prices and those are pages that just showcase the homes for sale. There’s no added content to those pages and the featured showcase pages show up on your homepage. 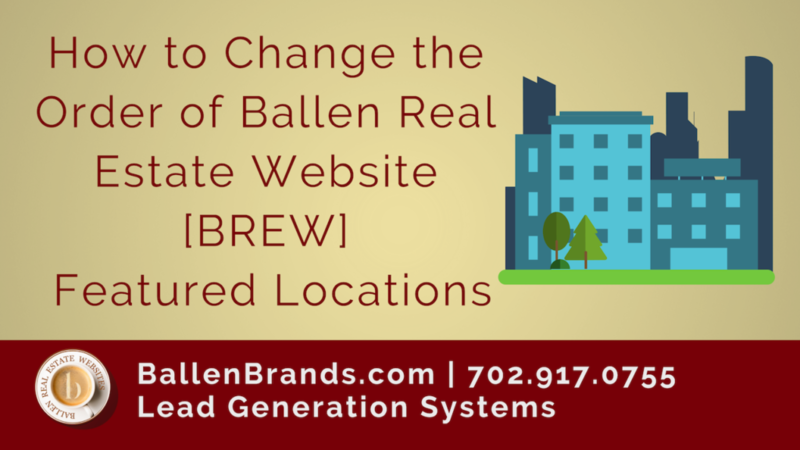 If you have any questions regarding this, please contact our team at team@ballenbrands.com. Or give us a call at 702-917-0755.